These fun little pizza snacks are oh-so-easy to make. Just top English muffin halves with spaghetti sauce and mozzarella then microwave until cheese is melted. Spread muffin halves with sauce; top with cheese. Microwave on HIGH 30 to 40 sec. or until cheese is melted. Substitute 2 KRAFT 2% Milk Singles for the shredded cheese. Add chopped red or green peppers before topping with cheese and microwaving as directed. 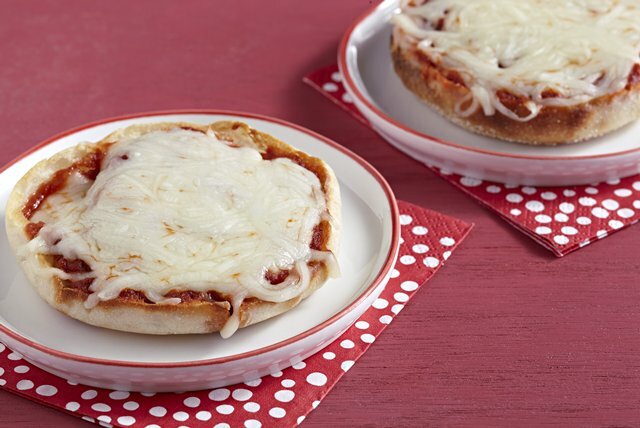 Prepare using whole wheat English muffins and topping pizzas with a dash of dried oregano leaves before microwaving.